Our initial experience reinforces the decisions we make. That’s why a positive first fit enhances the opportunity for hearing aid success. Sitting in the office in front of a patient as an audiology student, and later as a clinician, brought this to life. The truth of the matter is that individuals don’t skip with joy and happiness on the way into their audiologist’s office to receive hearing aids, and must put a lot of trust in their audiologist when he or she says, “you may not like the hearing aid in the beginning, but you need to get used to it.” Yes, hearing aid users are encountering sounds they have not heard in, sometimes, many years. It is true that hearing aid users need to get used to the sounds they are hearing. This idea of “needing to get used to something” is becoming more and more foreign to us, with the digital age that can grant instant satisfaction at the push of a button. But even historically, most purchases people make are based on an immediate emotional reaction. We buy a pair of shoes based on our immediate reaction at “first fit.” Is it comfortable? Can I wear it all day? We don’t think to ourselves, “it doesn’t feel right on my foot, but maybe I’ll get used to it.” Okay, maybe we do if the shoes are incredibly cute. But making decisions are immediate, emotional, and our initial experience reinforces the decision we made. Can we improve the first fit experience of a hearing aid? One difference between the aforementioned, emotional decisions for purchasing and the purchase of a hearing aid is the progressive nature of hearing loss. Typically this progression takes place over many years and makes deficits in hearing sometimes imperceptible. The re-introduction of these sounds can be unexpected. But what if there was a hearing aid that eased this transition? What if there was a hearing aid that sounded pleasant to new hearing aid users? Was comfortable? Was a great sound quality right at the first appointment that optimized the desire of that individual to wear the hearing aids and obtain all the benefit that hearing aid can provide? Now there is. I have to admit I was a bit skeptical (comes with the territory as a researcher). 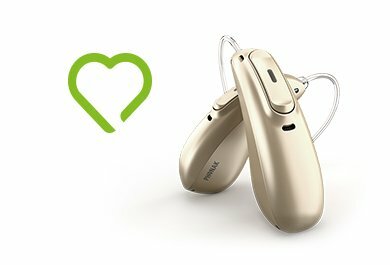 When I heard the “Love at First Sound” claim for the new Phonak Marvel hearing aids, I thought it was a typical “great sound quality” story. Yes, some hearing aids have sounded better than others in the past, but all within the realm of “sounding like a hearing aid.” All of that changed with Marvel. 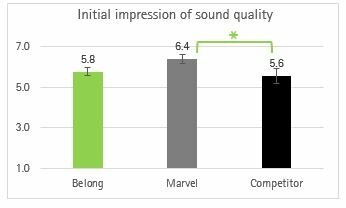 Average ratings for initial impression of sound quality (n=18). 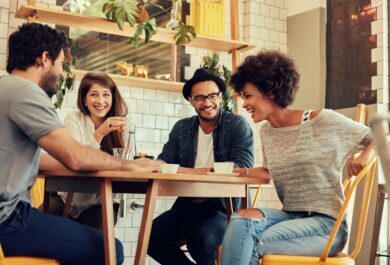 At the Phonak Audiology Research Center (PARC), we embarked on a study to determine if Marvel truly improved first fit acceptance over a previous generation of Phonak hearing aid, Belong, and a competitor’s hearing aid. It was extremely important that this study was double-blinded to ensure there was no experimenter or participant bias. Acoustically-transparent covers were used so neither the experimenter collecting the ratings nor the participant new which hearing aid they were wearing at any given time. 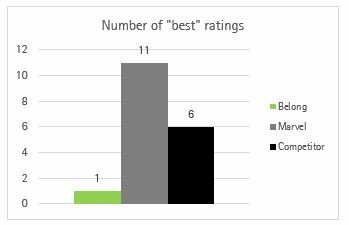 18 participants were asked to rate their preferences between Phonak Audeo Marvel, Phonak Audeo Belong, and a comparable, premium RIC hearing aid from a competitor. 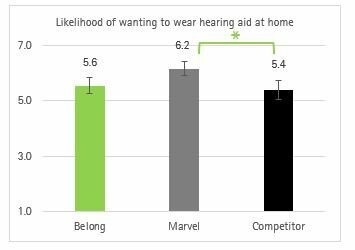 Average ratings of likelihood of wanting to wear hearing aids at home, based on first fit sound quality (n=18). The first part of the research appointment centered around “spontaneous acceptance”. This phase of testing was designed to capture initial impressions, similar to the first moments of hearing aid use in the audiologist’s office. Immediately following the fitting of each set of hearing aids, participants were asked to provide spontaneous comments, rate their likelihood of wanting to wear the hearing aid at home, and rate the initial sound quality (on a scale of 1-7, 7 being highest). When asked to rank the three hearing aid types, Marvel was rated “best” most often by blinded listeners. Number of times each manufacturer was rated as “best” for sound quality at first fit. The results of this study by PARC show the ability of Marvel to truly optimize the first fit experience for new hearing aid users in a way that hasn’t been done before. There will always be some component of adjustment to hearing aids, but a positive first fit enhances the opportunity for hearing aid success. It encourages new hearing aid users to wear his or her hearing aids and receive the full benefit of the features that are not activated in the clinician’s office. The truth of the matter is that a tremendous amount of hearing aid innovation revolves around automatic technology, speech in noise processing- things that will only be experienced with acceptance of the hearing aid. It all starts with the first fit. Learn more about Lori Rakita who is a Face of Audiology. 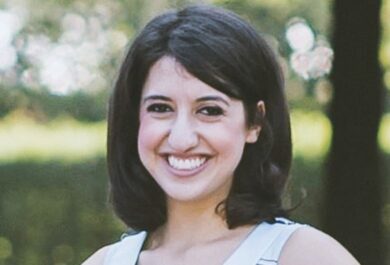 And, we invite you to read Lori’s previous blog post on her work as a research audiologist. No comments on “It all starts with the first fit”, yet. Lori has been with the Phonak Audiology Research Center since July of 2014. Lori performs technical measurements of hearing devices and features, and designs studies with human participants. Lori received her Doctorate of Audiology from Washington University in St. Louis.